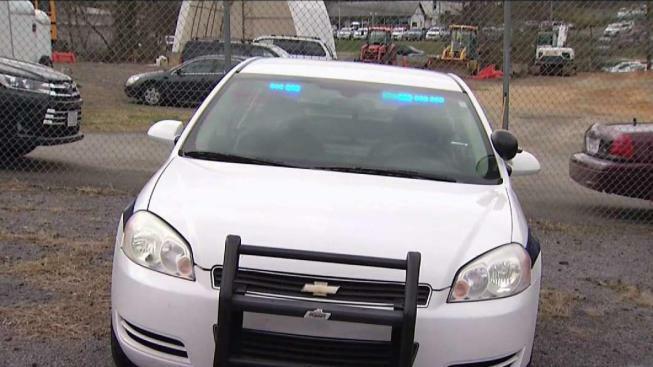 A man accused of impersonating a police officer was arrested in Virginia after allegedly following a woman through three states as he drove a car with police markings and a license plate reading "FILM CAR." He told police the vehicle had been used in a music video, according to authorities. It's the second time that the suspect, 28-year-old Jerry Lentz Saintvil, has been arrested for allegedly impersonating an officer, the Fauquier County Sheriff's Office said Wednesday. Saintvil, of Fredericksburg, is also accused of providing false identification to the deputy who pulled him over. Saintvil was arrested Saturday in the Warrenton area after a woman called 911 shortly before 5 p.m. and said she was being followed by a police car and was concerned for her safety, according to a release from the sheriff's office. The woman said a police car with functioning blue lights and "police" markings had followed her from western Maryland to West Virginia and then into Virginia. She said the driver was using the car's emergency equipment to move through traffic and seemed to be trying to keep up with her. "Was he going to keep following this person until they pulled over to get gas, or to rest? Who knows? And to initiate contact? We don't know. These are things we're trying to find out," said Sgt. James Hartman, with the Fauquier County Sheriff's Office. A deputy responded to the area and tried to catch up to the car, but authorities said the driver sped up and left Route 29 at the Meetze Road exit. When the deputy did stop the suspect, Saintvil told him that the car, which had a North Carolina tag, had been used to film a music video in Winchester, Virginia, and that he was on his way home to Fredericksburg, authorities said. Authorities say Saintvil gave conflicting statements to the deputy. They contacted the registered owner of the vehicle, who was uncooperative, they said. Deputies said they found a tactical vest with a "Special Police" badge, a Department of Justice pin with a DOJ badge, ammunition carriers, a police utility belt with a handcuff case, air soft gun and portable radios inside the car. Saintvil was charged with impersonating a police officer, second offense; false ID to law enforcement to avoid arrest, second offense; and driving on a suspended license, third or subsequent offense. He was held in the Fauquier County Adult Detention Center with no bond. Hartman said the woman did the right thing by not pulling over. Police said drivers can call 911 if they believe a police impersonator is following them or trying to pull them over. The Fauquier County Sheriff's Office is asking anyone who saw the car on Saturday in Fauquier County or elsewhere to call them at 540-347-3300. Anyone who has any information about Saintvil impersonating law enforcement is also asked to contact the sheriff's office. Callers may remain anonymous.